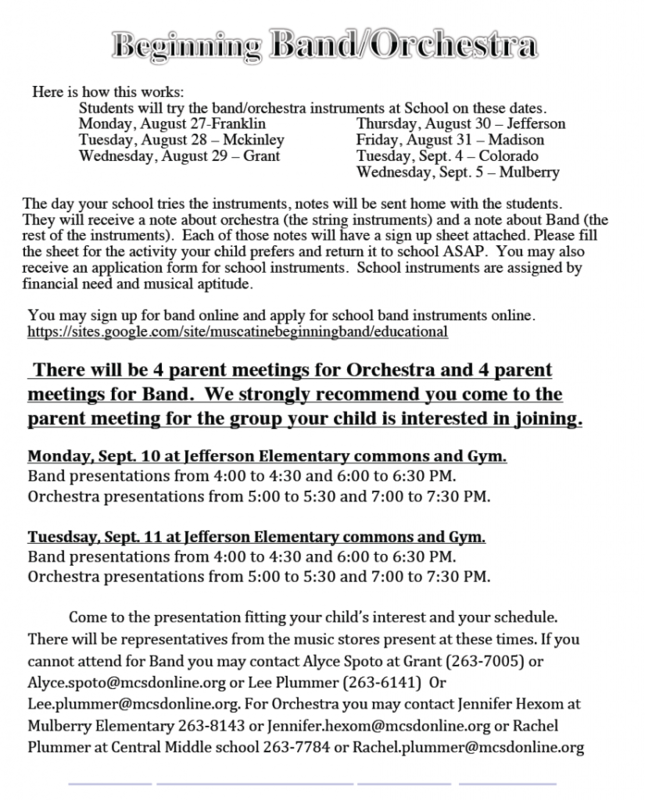 Description: Band and Orchestra Dates and Information for 5th Grade Parents and Students! Check out the flyer for additional details! Monday, August 27-Franklin; Tuesday, August 28 – McKinley; Wednesday, August 29 – Grant; Thursday, August 30 – Jefferson; Friday, August 31 – Madison; Tuesday, Sept. 4 – Colorado; Wednesday, Sept. 5 – Mulberry. The day your school tries the instruments, notes will be sent home with the students.They will receive a note about orchestra (the string instruments) and a note about Band (the rest of the instruments). Each of those notes will have a sign up sheet attached. Please fill out the sheet for the activity your child prefers and return it to school ASAP. You may also receive an application form for school instruments. School instruments are assigned by financial need and musical aptitude.